The prostate is a small, walnut shaped gland that produces seminal fluid. 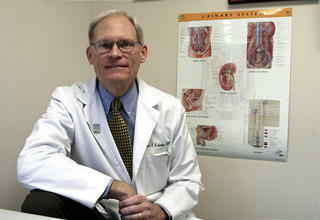 The prostate can cause troubles with urination, chronic pain and cancer. In fact, prostate cancer is the most common non-skin cancer in America, affecting 1 in 7 men. It is extremely important for men to be screened for prostate disease if there are any urination troubles, and beginning at age 55 for prostate cancer, and even earlier if a relative has had prostate cancer. An in-office consultation with Dr. Labasky in our Sandy location includes a thorough discussion about your symptoms; a review of your medical and surgical history and any records you might bring with you; a physical exam; and a discussion of options for care. You can then get started on treatment for your bothersome symptoms, or schedule any other testing that might be needed. A second opinion from Dr. Labasky includes a comprehensive review of medical records and your medical history, a prostate examination and a discussion of treatment options. A second opinion can validate your treatment decision or present you with other options of care. To schedule, call Dr. Labasky's Sandy clinic at 801-501-5300.